They say imitation is the best form of flattery, an adage which goes a long way to explaining the prevalence of song covers. What better way to pay homage to a favourite idol than through their music? There are a multitude of channels on YouTube filled with fantastic covers of K-pop songs, and PeuyeumUS is one of them. That doesn’t mean they are done with YouTube, though. After a brief hiatus in late 2012, the duo have returned to uploading covers of the latest K-pop songs as they are released, in conjunction with live performances; hopefully there will be more of both to come in the future. Seoulbeats would like to thank Angky and Arlene Budiardjono for talking with us, and wish them the best in their K-pop adventures. 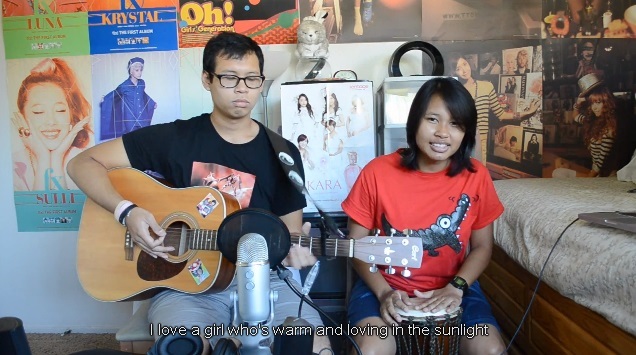 Readers, what are your favourite K-pop covers by fans? Have you seen any performed live? Let us know in the comments below!